Reports have emerged that Sprint Corp. (NYSE:S) is in talks with Charter Communications Inc. and Comcast Corp. (NASDAQ:CMCSA) about a partnership. According to reports, Sprint will put its merger talks with T-Mobile US Inc. on hold for two months. During that period, Sprint will be involved in exclusive negotiations over the possible deal with Charter and Comcast. Sprint is controlled by Japan’s SoftBank Group Corp. The talks may include a range of options, according to news reports. Charter and Comcast are apparently discussing a deal to take an equity stake in Sprint as part of the agreement. A minority equity investment was being discussed, as well as a deal where Charter and Comcast could jointly acquire Sprint. Sprint slid to fourth place behind T-Mobile in the wireless industry two years ago, with both behind rivals AT&T and Verizon. Desperate to stem years of financial losses, Sprint is experimenting with a number of ways to turn around its business. For example, the company is now offering those who switch from Verizon a year of free service. A wireless deal with the cable companies would allow Sprint to hedge against the risk that a merger with T-Mobile never goes through. However, Sprint’s negotiating position could weaken if the talks with Charter and Comcast fail and it were to restart merger talks with T-Mobile. Sprint shares jumped as much as 6 percent on the news, while T-Mobile’s shares fell 3.3 percent. Comcast and Charter announced a wireless partnership in May. Comcast wants to bundle mobile plans with its cable, internet and wireline phone packages ahead of the introduction of ultra-fast 5G networks. 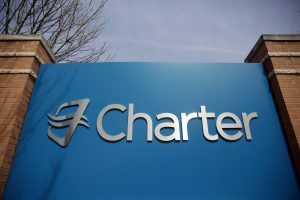 Charter plans to introduce its own wireless offering in 2018. Both cable companies already have network-resale or mobile virtual network operator agreements with Verizon Communications Inc. Under those agreements, the cable companies rent capacity to sell to their customers. However, that agreement restricts them to offer wireless within their own service areas, while a deal with Sprint may allow them to offer service nationally. The news stoked speculation about other potential merger partners for T-Mobile, with Dish Network Corp. being one of the most popular. Dish, a satellite TV provider, could be an attractive acquisition target for both Verizon and T-Mobile because of its wireless spectrum holdings. However, T-Mobile has no urgent need to sell itself or find a partner.